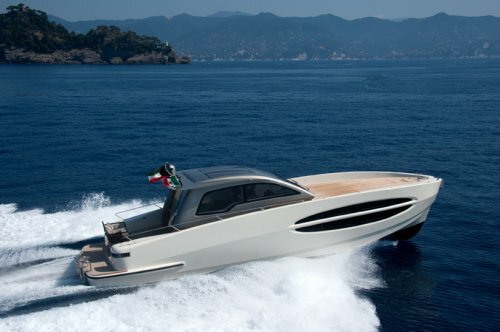 The Koot 54 is built in Tunisia by a team led by Italian Designer Francesco Maria Giulini. The exterior is designed by the KOOT Design Team, the interior is a project of Arch. Francesco Maria Giulini, whereas the water lines are designed by the renowned Naval Engineer Sergio Cutolo. 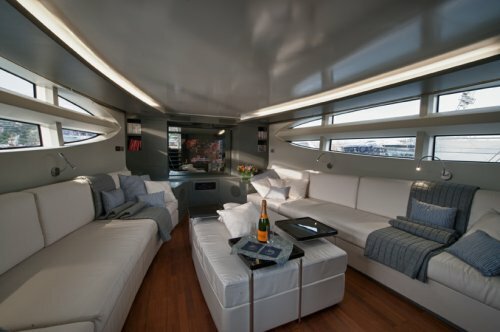 With its 16,5 meters in length and a beam of 4,9 meters, KOOT 54 is a yacht which offers unique uninterrupted spaces: the absence of cabins is compensated by a large lounge area directly connected to the upper deck communicating to the outdoor area and the sea. 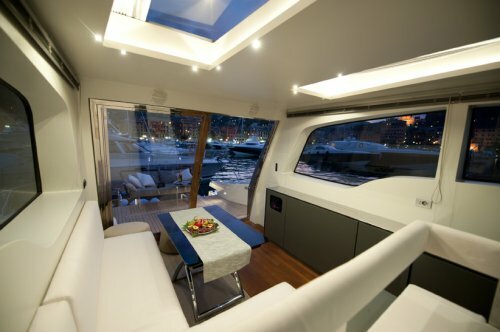 Large spaces outside as well: the transom is completely open to the sea and only three steps divide the cockpit from the large swim platform. 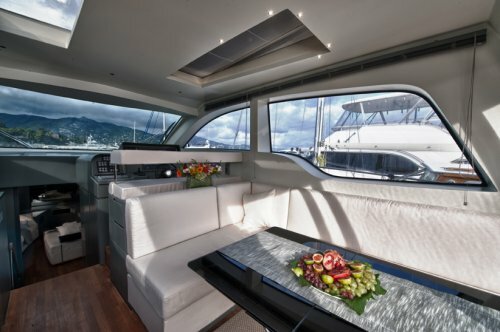 The upper front deck, dressed in teak, completely unobstructed, becomes an extensive and comfortable sun tanning area. 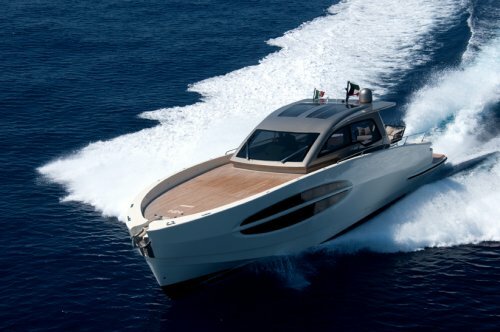 KOOT 54 has a V shape planing hull with variable deadrise angle: it is powered by n. 2 MAN R6-800 and can reach a cruising speed of 30 knots. Two fuel tanks for a total of 2400 liters will provide autonomy of approximately 300 nautical miles. 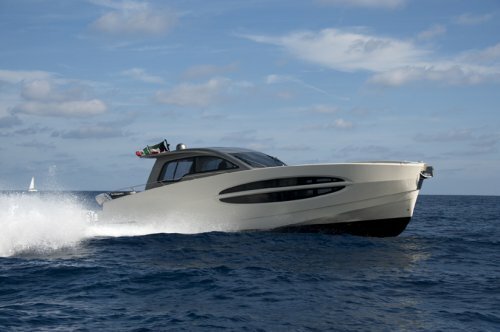 The Koot 54 is the first model produced by the Tunisian Shipyard Koot Yachts International: it is a 16 meters open with the design inspired by a custom typical of the Arab culture, the Dewaniya. Common spaces become the fulcrum of the social life and a get-together for families as well as for business. The ship-owner wanted to transfer on the water the feeling of his house. 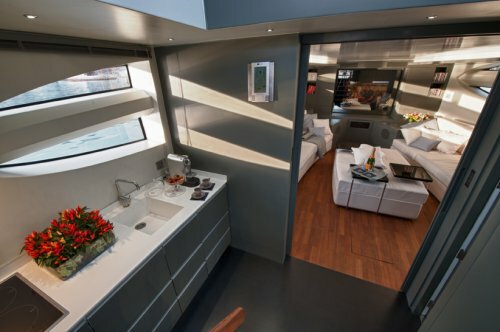 The spaciousness and livability of the Koot 54 give the guest a feeling of unobstructed freedom. The conviviality reigns thanks to the vast spaces without preventing intimacy when needed. In the Koot 54 the concept of the Dewaniya takes life: it is the place, and almost a ritual custom, where one greets the guest, very important element in any family tradition in Kuwait. The Dewaniya requires vast spaces, elegant, comfortable and in a nice environment, which, when needed, can become confidential and secret. 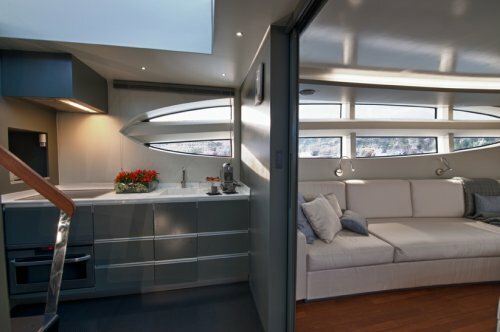 Therefore KOOT 54, in place of cabins, has a large under-deck salon, with huge and harmonious windows which let the light shine through allowing a splendid and unparalleled view of the sea. Following the same philosophy the exterior areas are large, safe and unobstructed like a terrace on the sea. 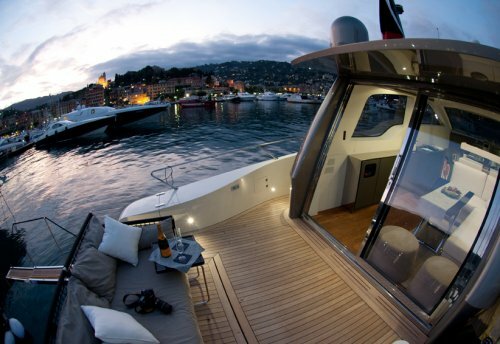 The boat becomes pleasantness, comfort, serenity. Rest and relaxation, as well as the glamour of a sophisticated and refined object, make owner and guest protagonist of something to be proud of. 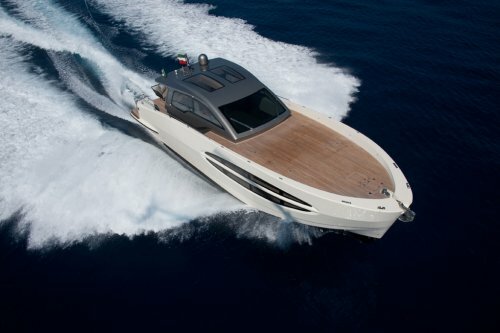 The Koot 54 is a day cruiser in composite (lamination with the infusion process) 16,43 meters long, with a 4,88 meters beam, built by Koot Yachts International in Menzel Bourguiba, Tunisia. All the local technical and production staff are highly skilled and the design and technical projects are led by Italian professionals. In fact all the technical planning was conceived by the renowned Naval Archietect and Engineer Sergio Cutolo and the exterior and interior design was by the KOOT Design Team coordinated by Designer Francesco Maria Giulini. Koot 54 has V shape planing hull with variable deadrise angle for better navigation. 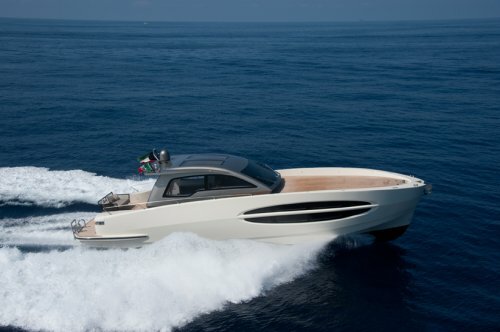 It is powered by n. 2 MAN R6-800 and can reach a cruising speed of over 30 knots. Two fuel tanks for a total of 2400 liters will provide an autonomy of approximately 300 nautical miles. The Koot 54 is noticeable for its unusual elegance. The upper cabin, painted in metallic grey in contrast with the oyster white hull, is the central element. It connects perfectly with the bow deck slightly risen from the stern deck and free from hand rails on the gunwale and therefore leaving the lines of the boat free of any further elements. 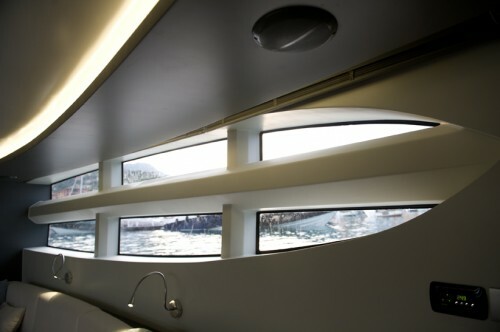 The result is a streamline also thanks to the elliptical windows on the hull. The only added element on the stern deck is the design couch acting as a separation from the steps (the stern is completely open to the sea) which give access to the swim platform. A 72 cm stainless steel and teak swim ladder adds a feeling of comfort as if the sea was the swimming pool of your loft. 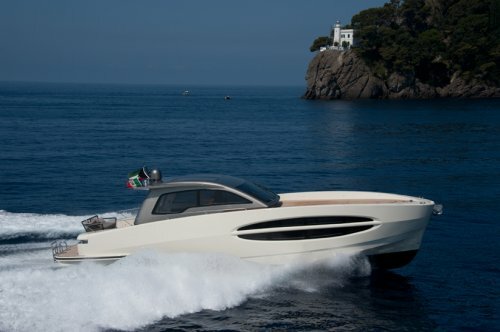 Through the lateral walkways, very comfortable and secure, one can arrive to the sun tanning deck, also free from any obstructions and which arrives almost to the level of the gunwale to maintain the sense of continuity with the surrounding sea. All the walkways, from the swim platform to the bow are dressed in teak; the courtesy LED lights are set in the wall of the gunwale. 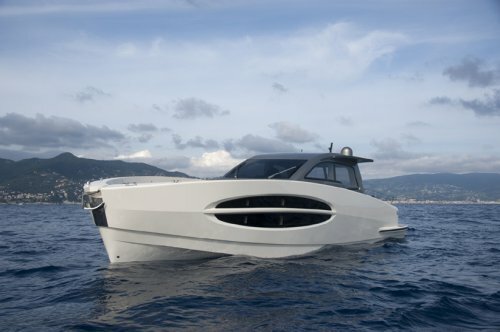 The garage, operated by two hydraulic pumps, for a 2,4 meters tender is set in the transom. INTERIOR DESIGN The cockpit, with a minimum height of 2,10 meters and oiled teak flooring, acts as connection between the exterior and the lower deck. 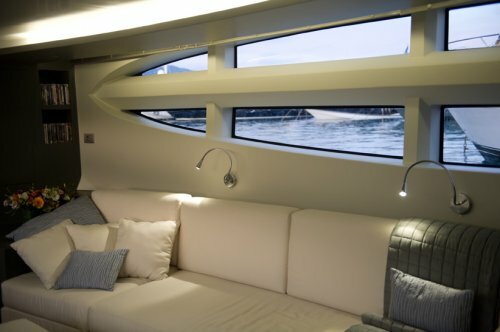 A stainless steel and lexan sliding door maintains the visual contact with the sea also from the interior. There is, on the right, a comfortable L shape couch for 5 people and the steel and glass table, adjustable in height and length, can accommodate up to 8 people. Along the left side one can find a cabinet with doors which also hosts the entertainment center: a lift operated 32” TV is set in a stainless steel counter top. In addition to the large lateral windows, there are also two skylights to add luminosity to the room and direct and indirect LED lighting allow for controlled nighttime illumination. The bench of the driving console can accommodate up to three persons. The stairs leading to the lower deck are in carbon fiber with the handrail in stainless steel and teak. 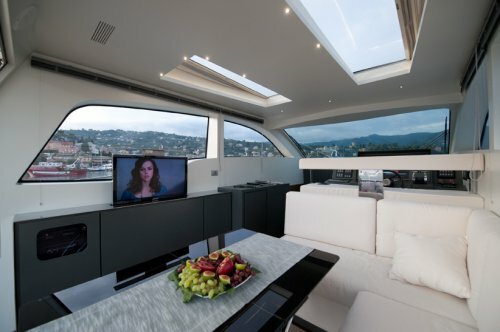 The lower deck is the other innovative design element of this yacht. There are no cabins: the lower area is divided in a kitchen, a large bathroom, and a 20 sq. mt. salon. The kitchen is fully equipped. It is exposed as an extension of the cockpit, with a carbon fiber floor. Being connected directly with the upper cabin, the kitchen roof reaches an incredible height of 3 meters. The bathroom, located on the starboard side, follows the philosophy of home comfort, with a design sink with two faucets, a carbon fiber toilet, and 90×90 glass shower box. A large double synchronised sliding door welcomes the guests to the salon the area that expresses in the best way the Dewaniya concept: a 20 sq. mt. open space, with oil finished teak flooring, two specular semicircular couches that can accommodate up to 12 people, a large ottoman which, joined to either couch, forms a queen size bed when needed. The feeling of spaciousness of the salon is increased by a large smoked mirror set in the niche of the cabinet wall. In reality the mirror turns in a modern 46” TV screen when turned on. The elliptic 4 meters windows on both sides of the room give an incredible amount of natural light as well as an almost 360° view of the sea almost at water level. 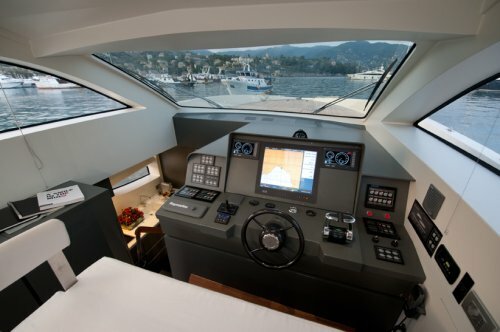 The air conditioning is present in all the areas of the boat, bathroom, kitchen and crew cabin included. The access to the crew cabin is through a hatch on the starboard walkway. All the operation equipment is stowed in a port locker as well as in the chain locker. 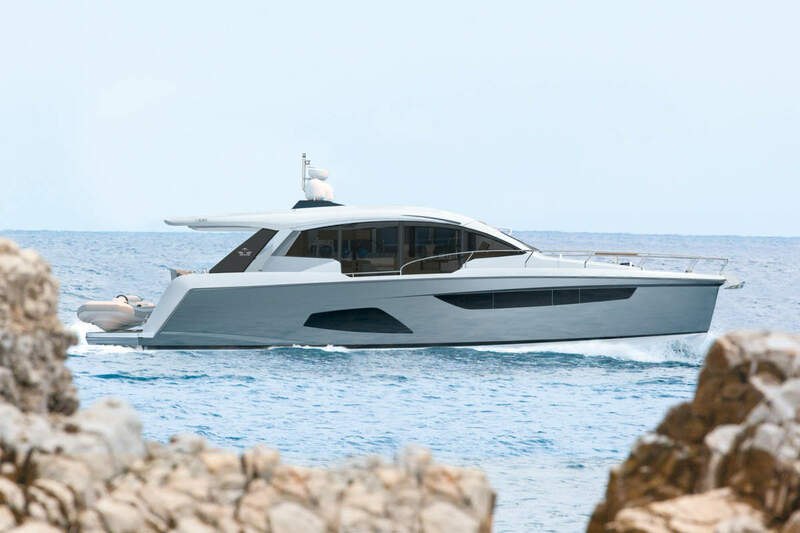 The KOOT 54 is radical in design but simplistic in its execution, it will certainly turn heads at any marina and will give the competition some food for thought.